85 – 95% of MMA fighters are using anabolic steroids? 18-Aug-2011 by THF in Hoot's Corner | Comments Off on 85 – 95% of MMA fighters are using anabolic steroids? If this fighter is correct in his allegations about his fellow fighters, then where is the public outrage about this behavior? Â When are we going to see Congressional hearings about the heavy use of these drugs? More to the point, where is law enforcement?? Â To possess these drugs without a legitimate prescription is a felony in most jurisdictions. Â Therefore, many of these fighters should be serving time in jail! Public leaders, wake up and recognize that our kids watch these fighters just like they do baseball and football players. Â And that we should not continue to be “shocked” to find such a large number of kids that are making the decision to use steroids to help them out in whatever sport they are participating in. was in the news this time last year, though it had nothing to do with his choice of fight attire. 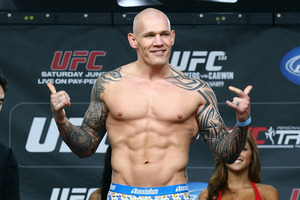 Prior to his UFC 117 bout withÂ Ben Saunders, Hallman told Inside MMA that he believed, at the very lowest possible number, 50% of fighters in the sport used steroids. He would later rescind those comments in his post-fight interview with Joe Rogan. Soszynski later denies using steroids for MMA, though he hints at prior use during his body building days. (“”Back in the days when I was a bodybuilder, obviously it was a little different. But for mixed martial arts, I don’t. I don’t believe in it.”) He also offers his thoughts on therapeutic exemptions (everyone or no one) and the necessity of random, out-of-competition testing. Soszynski’s numbers don’t shock me. There’s only a small handful of fighters I would be shocked to find out were doping, and the current testing situation gives a fighter every incentive to use. MMA is in the same situation as baseball found itself at the turn of theÂ millennium. A handful of guys speak about the general use in the sport, the media largely ignores the issue outside of positive tests, and no one names names for fear of being ostracized.Â B.J. PennÂ toldÂ Kevin IoleÂ he believed (believes? )Â Georges St. PierreÂ is on steroids, and was subsequently brow-beatenÂ into an apology.